Its taken a team of over 130 BYU engineering students and more than seven years to complete the task but now their Electric Blue Electric streamliner has finally broken the electric car land speed record. 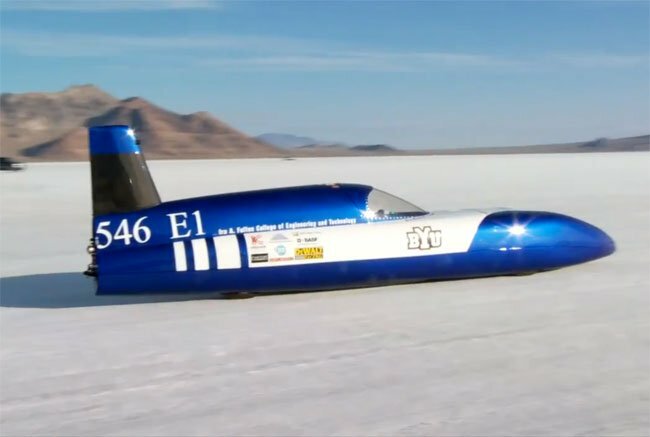 The Electric Blue streamliner raced down the Bonneville Salt Flats setting an average speed of 155.8 mph and hitting a maximum speed of 175 mph. The Blue Electric streamliner is powered by lithium iron phosphate batteries and now holds the record for electric cars under 1,100 pounds. Watch the video after the jump to see it in action completing its two runs. The streamliner has a custom-built carbon fiber body which was modelled on a wind tunnel program for aerodynamic performance. Earlier attempts to break the land speed record resulted in a top speed of 180 mph but unfortunately the car rolled the streamliner while completing the run.